The Marple Wharf planning application will not come to the September Marple Area Committee meeting for determination. It is expected to come to the next Marple Area Committee on the 7th November 2018 (there is no meeting in October). We will continue to monitor the situation and confirm progress of the application to Area Committee as soon as we know. 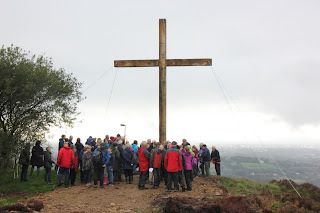 On Sunday 16th September a group of the Marple community braved the mist and rain to walk up from Linnet Clough to the new cross for a service of dedication, celebration and thanksgiving for the new "Cobden Cross". 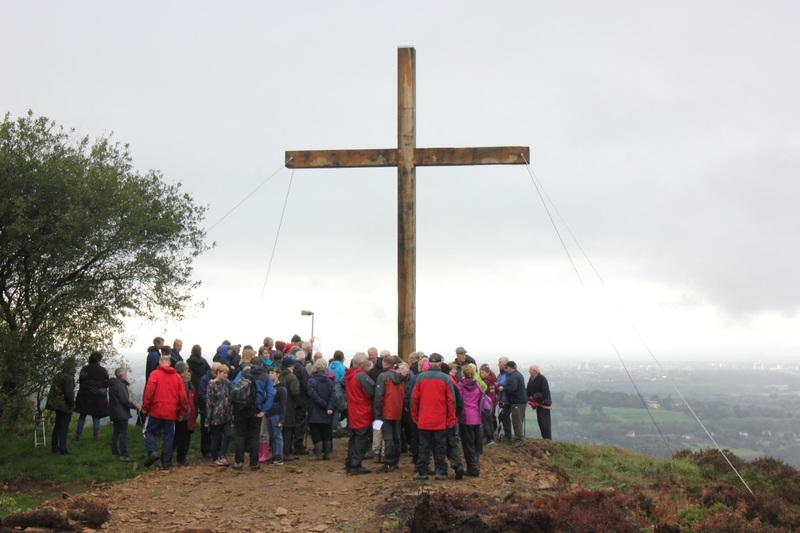 Marple Civic Society is one of the many local donors that has enabled the cross to be replaced by the council of churches in Marple, Compstall, Marple Bridge and Mellor. 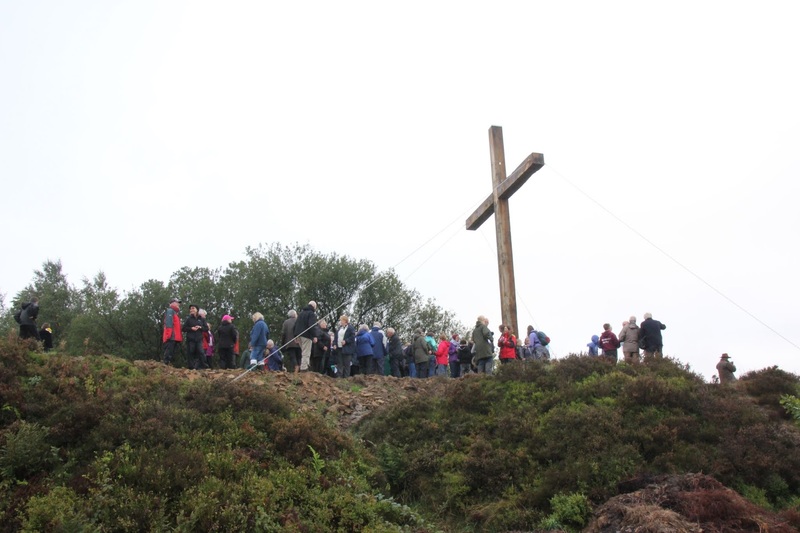 The New cross of solid French Oak sat in a stainless steel cradle, that replaces the old cross that had rotted and broken, now stands as a symbol of the christian community in the area. As the cross was dedicated the mist slowly rolled back and by the time the congregation was leaving the sun came out. This great land mark now fully restored has a guaranteed life of 500 years. Finally, after almost 10 years, the fate of Marple Wharf is likely to be decided on Wednesday 26th September 2018 at the Marple Area Committee meeting. Now, we can only put our trust in our councillors to do what they are elected to do i.e. vote on the planning application and give their reasons for their decision to their electorate. We therefore trust that all councillors will use their vote and that the decision is made by them in Marple - not shunted off to a planning committee that has little knowledge of, and no passion for Marple and Marple Wharf. Recently, the application has been held up yet again because, this time, the highways engineers were not happy with the access arrangement. In order to satisfy them, CRT's developer, H2O Urban, have had to alter the already unsatisfactory parking arrangement. The result is an even more confusing parking scheme and the loss of one visitor parking space (only two spaces remain). This demonstrates, yet again, that the site is too small for the development that is being crammed into it. See the civic society's response to this latest amendment HERE. If you have not yet responded to the Marple Wharf planning application, or wish to send further comments, it isn't too late to do so. You can view previous responses HERE & HERE Please feel free to use our responses to help you to write your own if you wish. We will confirm details of Marple Area Committee once the agenda is released one week in advance of the meeting. Confirmation will appear on our website when it is known and members emailed accordingly. The venue for the Area Committee meeting is Marple Senior Citizens Hall in the Memorial Park and it will start at 6pm. 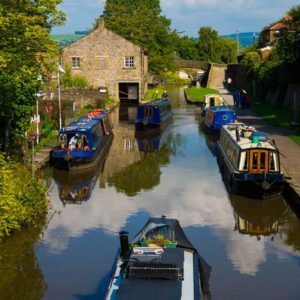 Attending the meeting is the last thing you can do for Marple Wharf. Although public speaking will not be allowed, your presence will speak volumes to those making the decision.